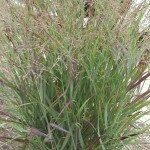 The best time to trim ornamental grasses and liriope ground cover is early spring before the new growth starts. If you wait to long to cut, the new growth is mixed in with the previous year’s grass — making the cut a much more time-consuming job. Don’t be shy about cutting grasses and liriope. Grab the grass in sections and cut down to a few inches fom the ground using pruners or a tree saw.